A long-simmering ethics investigation of former Democratic gubernatorial nominee Andrew Gillum heated up Friday when a state ethics panel said there was probable cause that Gillum violated Florida's ethics law. The state's ethics commission voted in a closed-door meeting Friday that there is enough evidence to show that Gillum accepted gifts from lobbyists during his time as Tallahassee's mayor. Gillum narrowly lost the governor's race to Republican Ron DeSantis last year. During the bitter contest, DeSantis pounded Gillum over the lengthy investigation that centered on trips he took to Costa Rica and New York City, including who paid for tickets to a Broadway showing of the popular musical "Hamilton." 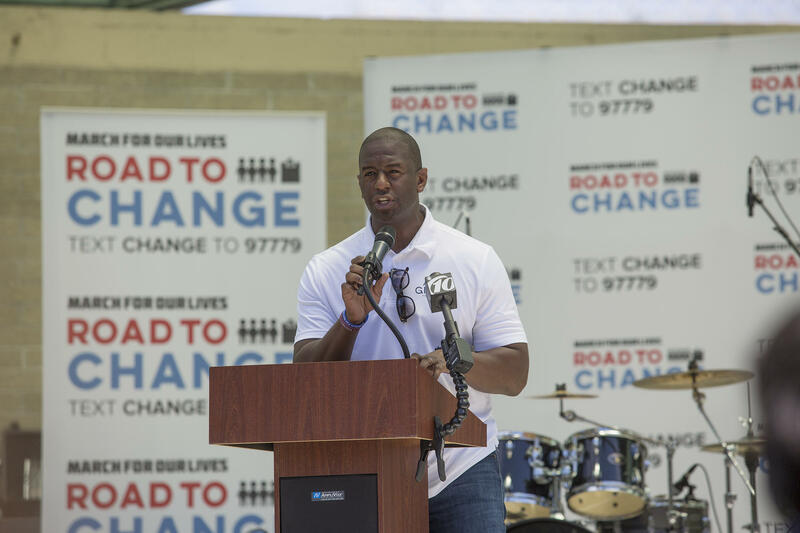 Gillum denied the allegations during the campaign, saying at one point "I don't need anybody handing me anything for free." Barry Richard, who is representing Gillum in the investigation, said his client would contest the findings before an administrative judge. "I don't think there's any evidence he did anything wrong," said Richard, a well-known Tallahassee attorney who once represented George W. Bush in the legal battles over the 2000 presidential election. Richard maintained in a filing with the commission that the allegations against Gillum "hang on a very slender thread" because they rely primarily on a lobbyist and one-time friend of Gillum's. Details about Gillum's 2016 trips to Costa Rica and New York City first came to light in the wake of an FBI investigation into corruption in Tallahassee city government that broke into the open in June 2017. News outlets reported that, during the Costa Rica trip, Gillum's lobbyist friend Adam Corey set up a meeting in Tallahassee between the mayor and undercover agents posing as developers, and that Gillum also met with the agents during his time in New York City. Gillum has said previously the FBI has told him he is not a target of its investigation. Last month Scott Maddox, a city commissioner who once ran the state's Democratic Party, was indicted on 44 counts, including charges of bribery, extortion, bank fraud, racketeering and other crimes. Maddox has pleaded not guilty and has been suspended from his position. Erwin Jackson, a Tallahassee businessman and long-standing critic of Gillum, filed an ethics complaint against Gillum. Under Florida law, local officials cannot accept gifts worth more than $100 from a lobbyist or a company that hires a lobbyist. The commission ultimately concluded there was probable cause for five violations, according to Richard. The commission cleared Gillum of one allegation that he had asked for the gifts. Gillum could eventually be forced to pay civil penalties up to $10,000 per violation. But the commission agreed with commission staff who concluded that Gillum did not pay all the costs for the Costa Rica trip that he took with his wife. Records show that Gillum used his credit card to pay for airfare and Gillum asserts he gave Corey cash to pay for four nights at a luxury villa. But Corey contends that he never received any payment. There also allegations that Gillum got a ticket to "Hamilton" for free as well and a private boat trip to the Statue of Liberty. Gillum said in a sworn declaration to ethics investigators that the "Hamilton" ticket was given to him by his brother and he assumed he had paid for it. Corey, however, said the tickets were paid by a FBI undercover agent. Marcus Gillum said he got the tickets from Corey and offered to pay for them at the time. He said he paid Corey back by giving him three tickets to a Jay-Z concert each worth $280.